Editor's note: Nancy G. Brinker is founder and CEO of Susan G. Komen for the Cure, an organization that promotes breast cancer research, education, screening and treatment. (CNN) -- In a long and wonderful life, Betty Ford became one of America's most influential and accomplished first ladies and one of our nation's foremost advocates on behalf of those suffering with alcohol and drug dependencies. By founding the Betty Ford Center she bravely writ large her own personal struggles while leading our nation to understand that substance abuse and addiction were serious issues that needed to be openly discussed, just as she had helped us earlier learn to talk about and cope with breast cancer. Before Mrs. Ford's candid revelation of her own breast cancer in 1974, public discussion of such a thing had been unheard of, and the impact of the personal news she shared affected millions of lives. Almost immediately, doctors reported an increase in women asking for screenings. Many women who had hidden or denied a lump in their breast found the courage to take action. News coverage brought the words "breast cancer" out of the shadows and into the public discourse. Betty Ford opened the door for so many women, myself included, encouraging us to deal honestly and openly with this disease at a time when breast cancer was swept under the rug. She inspired me personally to do everything I could to keep pushing that door open. She made it possible for me to understand that I was not alone, that I could be part of ending suffering from a disease that is still the most commonly diagnosed cancer in women. 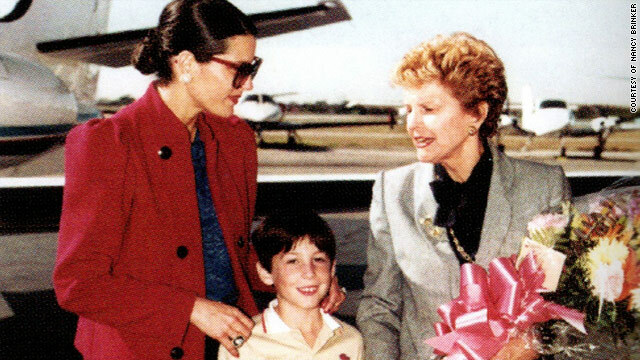 I remember the day in 1982 when my son Eric and I -- he was just 7 years old at the time -- greeted Mrs. Ford as she stepped out of a plane and into the stifling Dallas heat to help launch our new Susan G. Komen Foundation (later to be named Susan G. Komen for the Cure). My eyes filled with tears: One of the most courageous first ladies in history was here helping to fulfill the promise I made to my sister, who died of breast cancer in 1980, to do everything in my power to end this disease forever. When we asked Mrs. Ford to join us for the women's polo tournament that we'd organized to raise funds for our fledgling organization, she readily agreed, as long as we could guarantee that she wouldn't have to get up on a horse and play. But as always, she did so much more than just show up. She worked closely with me and a handful of our original volunteers, including Texas Sen. Kay Bailey Hutchison and then-Dallas Mayor Annette Strauss, to help us get our breast cancer movement off the ground. In doing so, she helped change the world for millions of breast cancer survivors and their families. In 1985 I received a personal phone call from Betty Ford that I will never forget. She called me right away when she learned that at age 37, I had just received a breast cancer diagnosis myself. Betty sensed my despair and fear and took the time to walk me through it; she gave me the courage to face my treatment, to face what lay ahead. "You don't stop," she told me. "You get through it, one day at a time, and if a day is overwhelming, one hour at a time." I will be forever grateful for that call -- the first I received after my diagnosis -- and the steady voice she shared with me that day. With courage, grace and compassion, Betty Ford held a mirror to her own struggles in order to help others lead healthier and better lives, and her boldness inspired a nation. As a 93-year-old breast cancer survivor, her long life was truly a testament to the work that she did to combat stigma and bring awareness to the health issues of breast cancer and addiction. She leaves us a great legacy, and all of us whom she helped and cared about mourn her passing with enormous respect, deep sadness and unmatchable gratitude. The opinions expressed in this commentary are solely those of Nancy Brinker.